I spent this past weekend hanging out in New York with a darling, fabulous friend. And between the excellent girl talk, sushi, bagels, and flea market strolls I felt something – I felt the sun getting lower, the shade getting cooler – I felt the promise of fall. And it was glooorious. I love that fall means layers and boots and hot drinks and cozy socks, and I know lots of you agree, but we need to chill right out for a minute. We have three weeks of summer left to enjoy, during which all the best things about the season will likely be at their peak levels of awesomeness – including tomatoes, cucumbers, corn on the cob, barbecues, and those elusive, perfectly hot but not horribly sweltering afternoons. 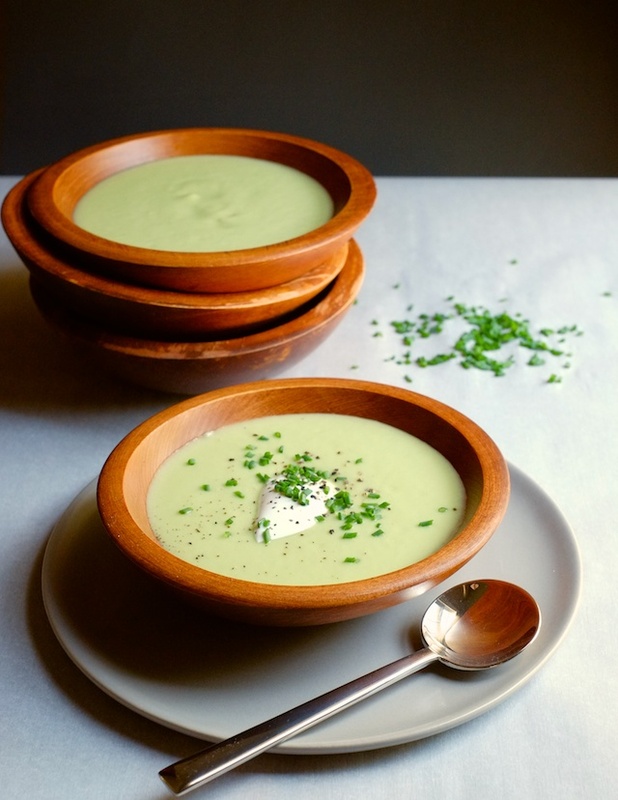 This chilled soup is the perfect thing for a sun-speckled, early-evening, late-summer meal, maybe as a prelude to pasta or grain salad. It’s light, yet rich, and easy to throw together if you have five minutes and a blender. Plus it makes the most of late summer cucumbers, which can be a little much after two months of unrelenting bounty. Normally when I make a puréed hot soup, I use chicken stock or vegetable stock to thin out the purée, but here that didn’t seem right, (I didn’t want that slow-cooked broth flavor) so I used water to keep it tasting fresh. Adding water to a soup sounds like kind of a dumb thing to do, but it works if you season the soup really well to make up for the gap in flavoring. The essential ingredients to make this soup flavorful are lots of salt, a generous squeeze of lemon juice, and a touch of raw garlic. Let’s not put away our sandals just yet. These last weeks of summer are probably the best. 1. Put diced avocados, cucumber, garlic, lemon juice, and salt in a blender with 1 cup water. Pulse until smooth. If you want to serve this soup immediately, use cold water. 2. Taste soup and add more garlic, lemon, or salt as needed. If the soup is very thick, add more water and pulse again until it is incorporated. Repeat tasting process until the soup is well seasoned. 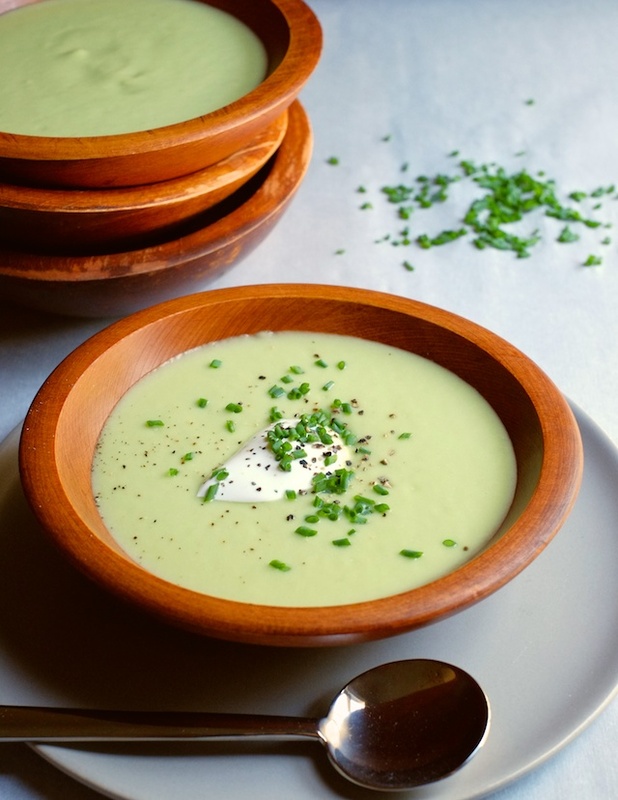 Trust your taste buds here – this soup should be light and refreshing but not bland at all, don’t be afraid of heavy-handed seasoning/lemoning etc. 3. Chill soup for 20 minutes (up to overnight). Taste it again once it is cold (flavors will develop as the soup sits and will taste slightly different cold). 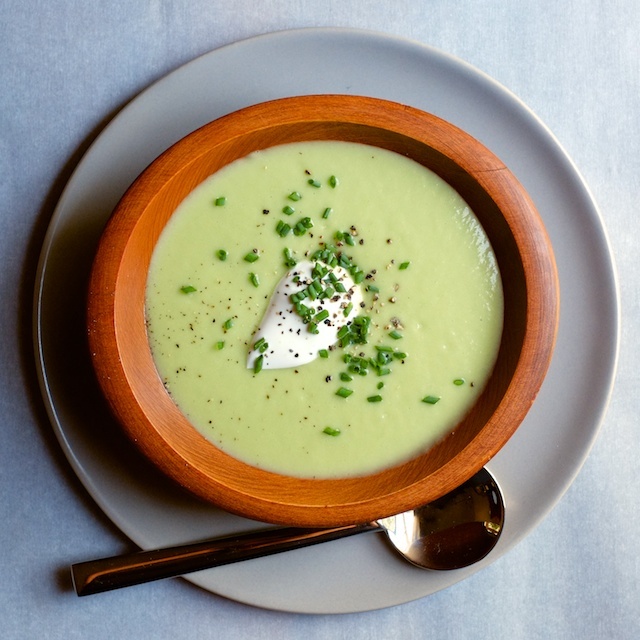 Serve topped with sour cream, chopped chives, and a grind of black pepper. Beautiful colors in your pics!!! Thank you Amy! Natural light is the best.